Even though it's expensive and highly sought after, it's really not all that scarce and difficult to find in high grade. Montana's legacy as perhaps the greatest quarterback of all time is the key value driver more than anything. He was incredibly dominant throughout the 1980's and therefore is incredibly popular among fans and collectors. 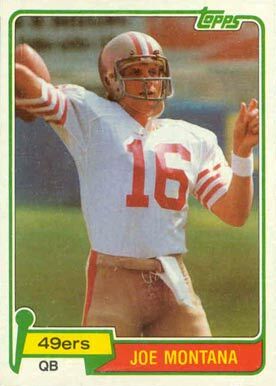 The Joe Montana rookie card was not released until his third year of professional play. He threw only 23 passes in 1979 and did not become the starter in 1980 until about halfway through the season. But, in 1981 he started every game and led the 49ers to one of its most successful seasons to date going 13-3. Centering is probably the toughest challenge for collectors. No one likes for a card to be off-centered but unfortunately the 1981 Topps football set suffered from this issue quite often. The back of the card speaks of his fame at college football powerhouse Notre Dame and the 1977 national championship to which he led them. Simply amazing given he was once a seventh-string quarterback at Notre Dame. His statistical and personal information is also displayed. A California native standing at 6'2", Montana was not the tallest of quarterbacks but that obviously didn't slow him down. It's the key card to the entire 1981 Topps football card set and the standout of a group of other well-known rookies such as Dan Hampton, Art Monk and fellow teammate Dwight Clark. The first thing most collectors ask is: how much is a Joe Montana rookie card worth? These days a Montana rookie card in a PSA 10 holder usually sell for around $15,000 or so. If you're lucky you can get one for a bit less than that but don't count on it. Once you start looking in the PSA 9 range, then you should generally expect to pay between $600 and $900. It's a broad range. How do buyers and sellers determine the value of a Joe Montana rookie card? Montana went on to become one of the greatest quarterbacks of all time. He was an 8-time Pro Bowler, 2-time MVP, and 4-time Super Bowl champion. His dominance of the 1980's is the stuff of legend. At a time when the 49ers had struggled for years, he was exactly what they needed when he stepped into the starter role permanently in 1981. It's surprising given that the team took him in the third round of the 1979 draft. What a steal! You won't find him ranking in the top 10 of many of the main quarterback stat categories but the game has changed immensely since Montana played. Nowadays, the game is so pass heavy that it's not really fair to compare some of his stat totals to players of today. But people will never forget how cool under pressure he was. And how he could lead a team from behind for a win. There's likely no one else you'd want at the quarterback position when the game was on the line than Joe Montana. Elected in his first year of eligibility to the Pro Football hall of Fame in 2000, he was the first 3-time Super Bowl MVP. And he still holds the Super Bowl record of most passes without an interception at 122 and highest quarterback rating of 127.8. See what I mean? How could you not want him under center when it counts the most? That's what makes Joe Montana football cards so collectible.